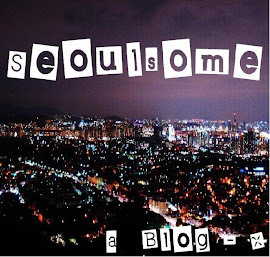 Seoulsome: Heavy Rain ~ AGAIN! So I thought the rainy season was done and dusted for this year. It had seemed long enough anyway but after a few days of sun a huge storm has hit Seoul. I'd been visiting the National Museum of Korea yesterday and was lucky enough to have an umbrella with me when the rain began. Although the umbrella wasn't much use in the end because as you might already know when it rains here, it pours! I got well and truly soaked. Pretty much my head to toe was wet. It wasn't my prettiest moment I have to say. Then this morning I was actually woken up by the thunder it was so loud. It seems to have been raining throughout the night and from what I read on the Internet this morning this rainy season has broken some records. 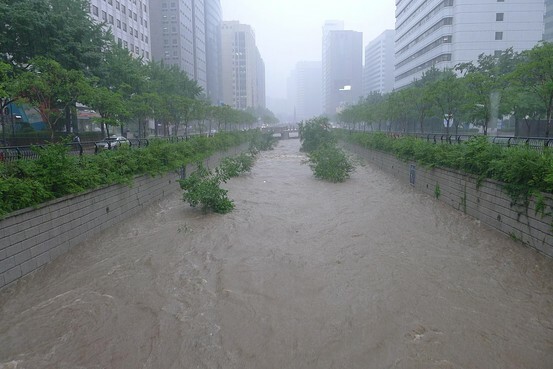 Seoul has received over 838mm (33inches) this July and about 400mm of that has fallen yesterday. Cheonggyecheon - A stream in Seoul's centre. runs between those small trees which you can see partially submerged in the picture. Now usually I get pretty excited about a spot of rain and some moderate flooding. I love to wade through flooded riversides in my wellington boots and when I was a child my dad always took us (my brothers and I) to look at flood waters stretching out across farms in the English countryside. It's quite a sight and reminds you of your own tiny insignificant size against the power and sheer scale of the world and nature around you. 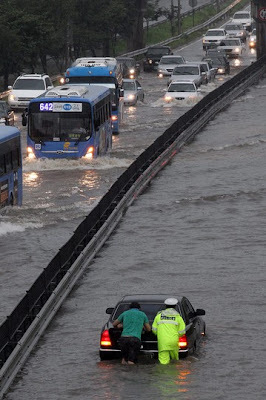 Sadly this rain, here in Korea, has had some terrible consequences. Ten Koreans have died this morning in a mudslide this morning in an area called Chuncheon approximately an hour and a half from Seoul. Here in the city there's been hundreds of reports of flooding and some of the subway lines have been closed. The Han River, which runs through the centre of the city has broken its banks and the Olympic Highway (major road here) has been blocked because of the flood waters. I'm not working today so the next problem is what to do when the weather throws up road blocks (literally) like this?!! Well, I think I'm heading to the dry safety of a mall. There's two I'd really recommend to you. I really like Times Square Mall, located near Yeongdeungpo station. Take Exit 3 and walk across the main road down the street opposite. You'll pass a Family Mart and then Shinsagae Department Store. Times Square is right after that. You can't miss it. Really! The other Mall is Coex. Coex is all underground. I think I once heard it's the largest underground mall in Asia or maybe it was the world?! I forget....either way, it's big and you can you pass the day easily there. Go to Samseong Station and follow all the signs. Both malls have big cinemas (movie theatre) complexes, Uniqlo, Zara, ABC Mart, Accesorize, plenty of restaurants and an abundance of coffee shops of course! Have a nice, if a little soggy, day!